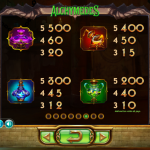 Alchymedes is a video slot game from Yggdrasil that takes us deep into a forest in an abandoned cabin to mix some symbols into cash prizes. There are 2 chemical apparatus on each side of the reels. The one on the left is filled with green liquid and the one on the right is filled with red liquid. The reels are set in a dark room that reminds us of both a library and a laboratory. Alchymedes is packed with special features that are somehow different than what we are used to see. Namely, you need to level up in this game to get a grip of the big prizes and it goes something like this. Every time you land a win, the background of the symbols involved turns gold. Once all the positions are gold you will move to a next level. 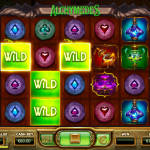 Before each new level you have to decide whether you like a better wild pattern or a increased multiplier. After each level you can receive one of these six mini features as a bonus. You can receive up to 2000 coins, x2 starting multiplier, x3 starting multiplier, multiplier increases with each spin, one wild pattern position added and the last one is two wild positions added. What make this game so attractive are the many features it has to offer. 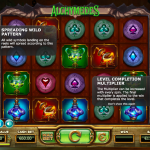 We love Alchymedes from Yggdrasil because it has something new to offer and we see it as a challenge. The game is well designed and the game play is engaging so all in all we have everything we need in front of us. The betting options are wide and they are made in particular to suit low to medium rollers. But high rollers can give this game a go for a change too. For another great engaging slot you should consider playing Winter Berries a 5 reel slot by Yggdrasil.